Last year the Egyptian caricaturist Samir Abdel-Ghani won the Journalists’ Syndicate’s Caricature Prize. Abdel-Ghani enjoys writing film scripts; he wrote the screenplay for the animation Duetto, the serial Joy Forest and Bom Bom, a film in production for the national cinema centre. He is also preparing a programme for television about caricature to be shown on Nile TV and Dream channel. Abdel-Ghani told Watani that his career in caricature began while he was still a student at Alexandria University, where he gained a business degree. In 1987 he ranked tenth in a caricature competition. A year later he came top, and from then on he embraced the genre. “I recall that in 1988 I went to a seminar on the poet al-Sayed Aql held at the cultural palace in Alexandria. While the poet was being honoured, I drew him. This drawing was published by the writer Khairi Shalabi in the magazine TV and Radio. “I then got a job in animation, which is more lucrative. Even so, I left it because I was captivated by caricature. After nine years I became a member of the Journalists’ Syndicate, and in the first year I won the first prize in caricature.” It is an achievement of which Abdel-Ghani is very proud. 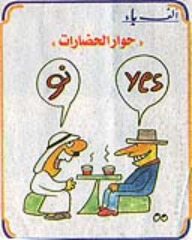 “You ask if caricature is moving backwards in content and value,” Abdel-Ghani went on. “If you had asked me this question two or three years ago I would have said yes, but in an age that has seen the publication of new papers such as al-Badil, al-Masri al-Yom, al-Dostour and al-Yom al-Sabie it shows the way is open for young, fresh talents to prove themselves. Asked if academic research might help promote caricature, Abdel-Ghani said this would contribute to raise awareness among those who are interested in the genre. However, the caricaturist needs to be known and his work to be discussed through television and radio. Watani suggested that some of Abdel-Ghani’s cartoons appear non-critical of violence against women. “I mainly depend on the caption balloon, trying to make it sarcastic and to make a punch; playing with words and puns, but using one style in drawing the cartoon. “I am not a good draughtsman, and I’m not shy to admit it. The most important, in my opinion, is to be honest,” he confessed.